It’s that time again, #flannelfriday! This week I am sharing what I use when I tell the story, I Took My Frog to the Library By: Eric Kimmel. This is a great book to use in ST as well as class visits. 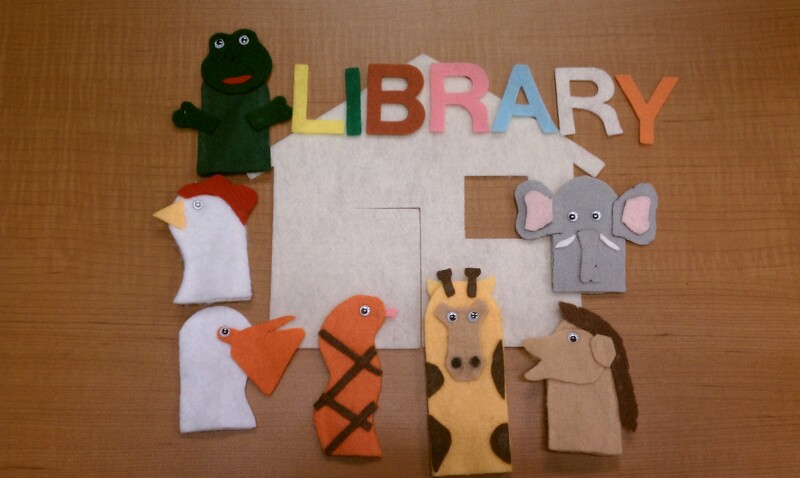 We had teen volunteers draw the templates to make these little guys, and they did a pretty darn good job! 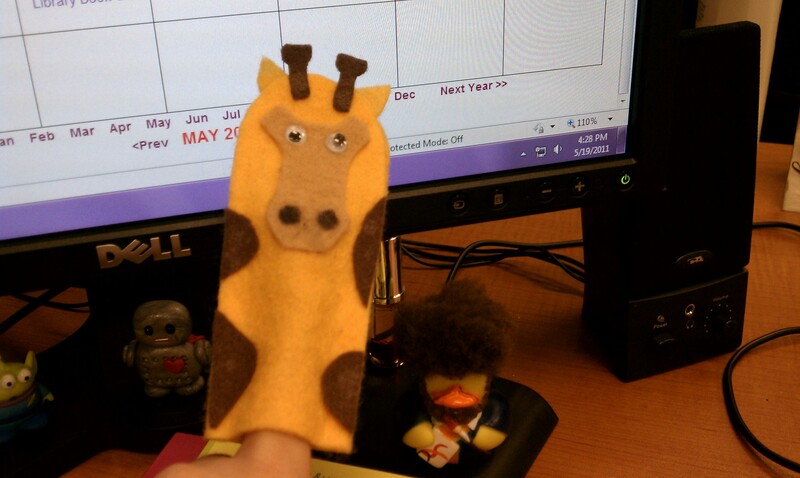 The great thing about these ones that were made is that you can use them on a flannel board OR as… finger puppets! This is my favorite way to use them. I will say it’s very hard to put ALL them on your fingers at the end of the story, but the kids have such a fun time laughing at me while I try to do it. It’s pretty entertaining. Also, I do want to add that I did change the story just a tad. I changed the part in the book that says that the “hen laid an egg on the card catalog” to, “she laid an egg on the computer keyboard”. So, it’s now a little more modern and the kids understand it more. Well, I hope you enjoyed this weeks installment of #flannelfriday, be sure to check back next week! If you have not heard of the book, Pete the Cat, I Love My White Shoes By: Eric Litwin then you need to go find this book NOW! It is definitely in my top 5 of favorite storytime books. I just love how wide the age range is with it. I’ve used it from 3 year olds all the way to 5 th graders and they all love it! 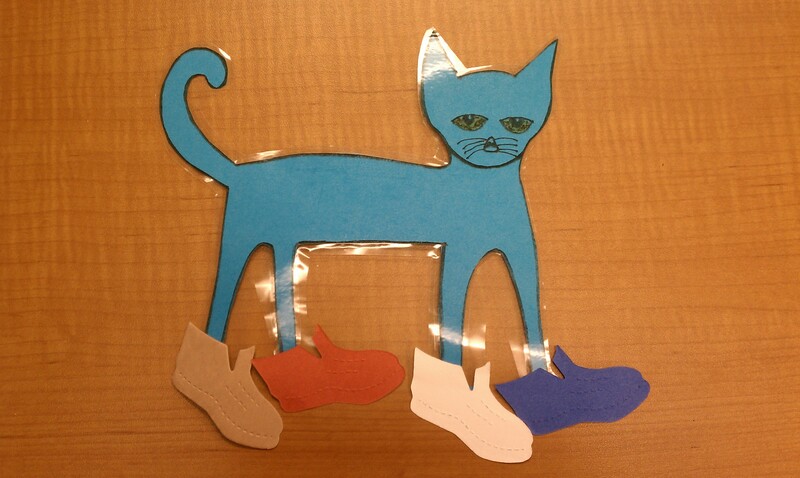 It’s a great story about a cat named Pete who sings about how he loves his white shoes. You have to hear the song that goes along with the story, here is the author and illustrator performing it live. The best part of the story is the ending, where they talk about the moral of the story. Great words to live by! I wanted to share what I like to do with the preschoolers when I read this story. I made a big cutout of Pete for a flannel board, then used our Ellison die cut machine to cut out the different colored shoes. The best part is we have 30 felt lap boards for the kids to use! So I made a set for each child out of paper, because felt is too expensive, for them to follow along with during the story. I’ve already used it several times and the kids love it! I’ve been trying to come up with more stories where I can use these lap boards and so far the only other one I’ve used is, I Took My Frog to the Library. I cannot be held responsible for you having the song stuck in your head all day now. Enjoy! *UPDATE* I was finally able to scan my copy of the Pete the Cat template. Feel free to use him!